1. Cook the rice and pressure cook the white beans. 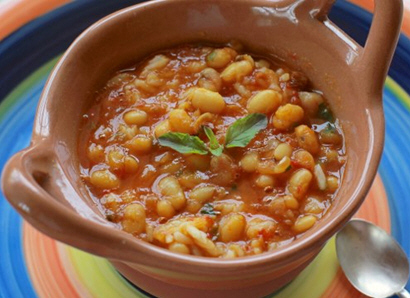 Beans should only take 15 minutes if not soaked over night, if soaked then only 10 minutes. 2. In a blender add the tomatoes, chipotle and green chile and blend until smooth. In a saucepan and on medium high flame add the ghee and tomato sauce. Then add all the remaining spices except the cilantro. Cook for about 8-10 minute until the tomatoes are fully cooked. 3. Then in a large pot add the sauce, rice and the cooked beans including all the bean cooking water. Cook for another 5 minutes. Now add the fresh chopped cilantro.